Many people would argue that religion is only necessary to enforce the virtuous and pious ways of living and that science is based on empirical couplets. It might sound nice but it is not true. Every form of a discipline such as art, science or philosophy co-exist with each other and some principals are studied in concurrence. Before the existence of atoms, we didn’t know that there might be sub-atomic particles that are responsible for chemical bonding leading to larger molecules which at advanced stages have the capability to give birth to life. Vedas had ample references of vacuum (shunya), atom or any other god-particle(bhraham) etc. Hence, Hinduism is a very scientific religion with its practice and ritual deeply rooted in science. In one of the article, physicist Roger Penrose suggested that the Big Bangis just one cycle among such events which proves that universe had several existences. This supports the Vedic philosophy that clearly indicates that the universe had several births and deaths. Einstein is associated with the origin of Theory of Relativity. But, one might be surprised to know that most of these statements resemble the Puranic texts. His theory popularly known as ‘twin paradox’ suggests that when a pair of twins goes to outer space, the other pair stays on earth. It is said that when the traveling twin returns, it will be younger than the other pair. 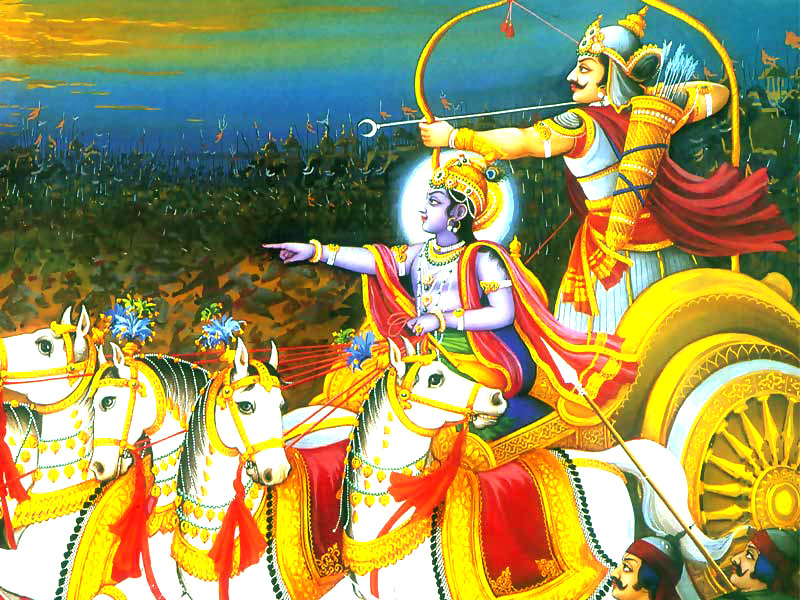 These passages resemble versus from Bhagavat Purana which communicate the relativity of time. There is another tale from Puranas that resembles Einstein’s experiment. A yogi, after exalting himself to higher realms from the earthly realm was told by the residents of the higher realm that it has been millions of years on our planet in few moments from the time he entered the higher realm. He was also told that all his relatives and people he had known were deceased. This was indeed the reference of relativity of time. A wonderful synergy is observed between Hinduism and science within the Vedas, as there is no clear line demarcating the two. Both of these theories can help us to understand our place in universe. Both of these disciplines ultimately transcend the matter’s realm, shed the materialistic means and bodies and helps us to enter the spiritual realm. It also suggests that beyond the atomic and sub-atomic particles the material of which we were accustomed to, there is an ocean of intangible thoughts that emerge and then disappear in very tiny small frames. It makes this physical world. If physics prior to twentieth century studied nature as we commonly see and religion only spoke about spirituality, then there would have been no congruence between the various disciplines as we see today. But this doesn’t imply that areas of congruence between science and Vedas is always misguided. Hinduism developed from its idea of universe being created from vacuum. It suggests a world emerging from a cosmic body called Brahmanda. It is believed to be the seed from which universe emerged which is not far from the idea of Big Bang. It is similar to the theories of cosmological science where this process keeps happening relentlessly like an oscillating pendulum. There are many disciplines described in the Vedas such as Vedic mathematics and Yoga that are a science in themselves. While Vedic mathematics suggests the way to solve the problems related to various corollaries of modern arithmetic in few seconds, Yoga is an extremely scientific way to combat stress and to get fit. Apart from benefitting an individual spiritually, the physiological benefits gained from Yoga are unparalleled. It also moderates the surge and the production of chemicals in the body that affect us mentally, psychosomatically, and physically. Hence, Vedas and Hinduism are full of such sciences that heal the body and mind naturally, and thus this answers the questions which ask whyHinduism is the best religion.